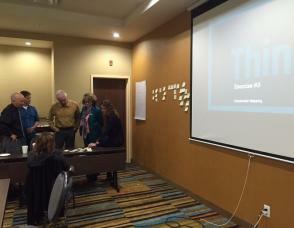 Tourism Kamloops has engaged the strategic talents of Destination Think! to assist in creating an industry engaged marketing plan for 2016. The first of several workshops in this process was held on October 8th to begin high level discussions to identify some of Kamloops’ unique destination features, opportunities for growth and overall stakeholder profiling. The planning process will happen over the next 4 weeks to arrive at a framework for tourism marketing on behalf of the destination for 2016. Destination Think! has been instrumental in aiding destination marketers around the world to stay relevant and remain competitive in their tourism marketing strategies. With their expertise, we are looking forward to producing a fresh, innovative, social at the core marketing plan for the upcoming year. Want to be involved? Please contact Monica Dickinson for more details!